Energy to the Max! 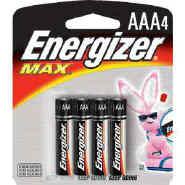 These Energizer® Max® Alkaline Batteries are designed for long lasting performance in a broad spectrum of devices. They also have a long shelf life - seven years, so they're fresh when needed. And, no added mercury means they can go out with the garbage.